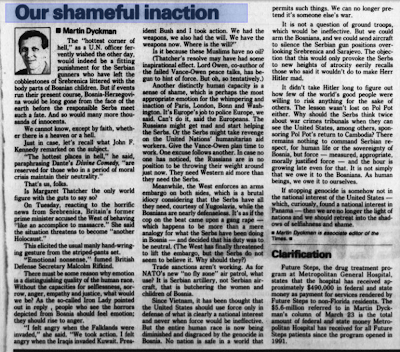 The following article, entitled "Our Shameful Inaction" was published in St. Petersburg Times on 15 April 1993, two days after the 1993 Srebrenica Children Massacre [click here to see video]. On 13 April 1993, the Bosnian Serbs attacked Srebrenica's elementary school, killing 62 Bosniak children and wounding 152 others. To this day, nobody stood trial for this crime. 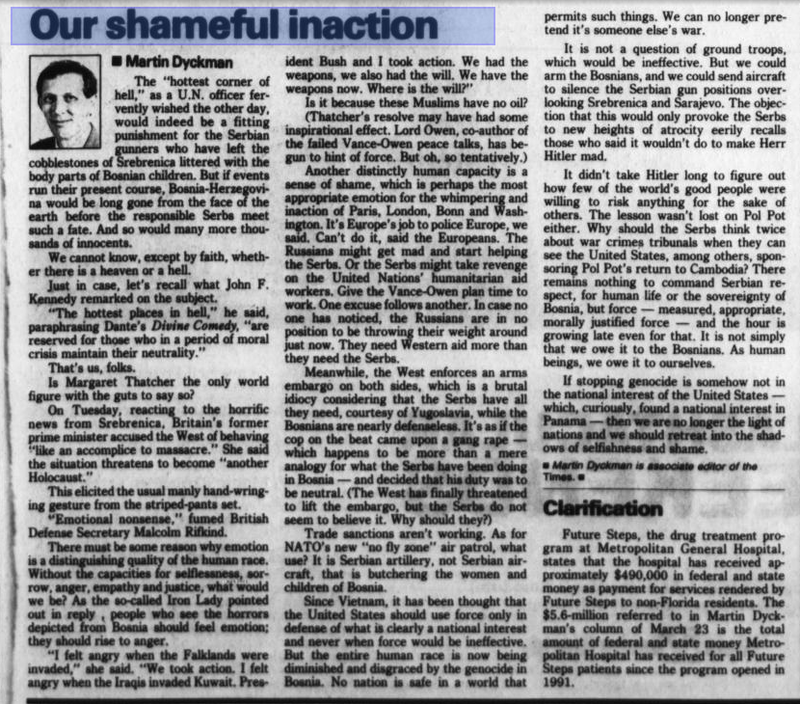 Following the 1993 Srebrenica Children Massacre, Martin Dyckman argued in his essay in favor of military intervention. Indeed, the only way to stop the deliberate butchering of Bosniak civilians by the Serbs stationed in heavily armed villages around Srebrenica was NATO-enforced military intervention, but it did not happen. The "hottest corner of hell," as a U.N. officer fervently wished the other day, would indeed be a fitting punishment for the Serbian gunners who have left the cobblestones of Srebrenica littered with the body parts of Bosnian children. But if events run their present course, Bosnia-Herzegovina would be long gone from the face of the earth before the responsible Serbs meet such a fate. And so would many more thousands of innocents. We cannot know, except by faith, whether there is a heaven or a hell. Just in case, let's recall what John F. Kennedy remarked on the subject. "The hottest places in hell," he said, paraphrasing Dante's Divine Comedy, "are lreserved for those who in a period of moral crisis maintain their neutrality." Is Margaret Thatcher the only world figure with the guts to say so? On Tuesday, reacting to the horrific news from Srebrenica, Britain's former prime minister accused the West of behaving "like an accomplice to massacre." She said the situation threatens to become "another Holocaust." This elicited the usual manly hand-wringing gesture from the striped-pants set. "Emotional nonsense," fumed British Defense Secretary Malcolm Rifking. There must be some reason why emotion is a distinguishing quality of the human race. Without the capacities for selflessness, sorrow, anger, empathy and justice, what would we be? As the so-called Iron Lady pointed out in reply, people who see the horrors depicted from Bosnia should feel emotion; they should rise to anger. "I felt angry when the Falklands were invaded," she said. "We took action. I felt angry when the Iraqis invaded Kuwait. President Bush and I took action. We had the weapons, we also had the will. We have the weapons now. Where is teh will?" Another distinctly human capacity is a sense of shame, which is perhaps the most appropriate emotion for the whimpering and inaction of Paris, London, Bonn and Washington. It's Europe's job to police Europe, we said. Can't do it, said the Europeans. The Russians might get mad and start helping the Serbs. Or the Serbs might take revenge on the United Nations' humanitarian aid workers. Give the Vance-Owen plan time to work. One excuse follows anotehr. In case no one has noticed, the Russians are in no position to be throwing their weight around just now. They need Western aid more than they need the Serbs. Trade sanctions aren't working. As for NATO's new "no fly zone", air patrol, what use? It is Serbian artillery, not Serbian aircraft, that is butchering the women and children of Bosnia. Since Vietnam, it has been thought that the United States should use force only in defense of what is clearly a national interest and never when force would be ineffective. But the entire human race is now being diminished and disgraced by the genocide in Bosnia. No nation is safe in a world that permits such things. We can no longer pretend it's some else's war. It is not a question of ground troops, which would be ineffective. But we could arm the Bosnians, and we could send aircraft to silence the Serbian gun positions overlooking Srebrenica and Sarajevo. The objection that this would provoke the Serbs to new heights of atrocity eerily recalls those who said it wouldn't do to make Herr Hitler mad. It didn't take Hitler long to figure out how few of the world's good people were willing to risk anything for the sake of others. The lesson wasn't lost on Pol Pot either. Why should the Serbs think twice about war crimes tribunals when they can see the United States, among others, sponsoring Pol Pot's return to Cambodia? There remains nothing to command Serbian respect, for human life or the sovereignity of Bosnia, but force - measured, appropriate, morally justified force - and the hour is growing late even for that. It is not simply that we owe it to the Bosnians. As human beings, we owe it to ourselves. If stopping genocide is somehow not in the national interest of the United States - which, curiously, found a national interest in Panama - then we are no longer the light of nations and we should retreat into the shadows of selfishness and shame.